I was 25 years old, and I was tired. Tired of being poor. Tired of not knowing where the rent would come from. Tired of having to count how many days I would have to stretch a box of spaghetti in order to eat every day. When my last $2 went in the offering plate. I was the one that put it in–knowing that $2 wouldn’t get me through ’til payday anyway, so I might as well put it in the offering plate as the gas tank. When I’ve had to pray for an extra job to come along, because I didn’t have the money to make the car payment. When I’ve been in debt up to my ears–credit card debt, student loans, mortgages, you name it. I’m not there anymore, thank God; but it’s only because I obeyed God in the ways we’ll talk about below that I got out of that place. It’s not that I wasn’t working hard. I’ve always been a hard worker. Always. My parents raised me to have a great work ethic. I was the one, in college, taking 24 credit hours in one semester. I’ve had a job for another employer since I was 14 years old, and I worked on my dad’s construction crew–sweeping sawdust, stripping roofs, shoveling construction trash, pushing wheelbarrows, nailing down roofing–since I was strong enough to carry a concrete block. So it’s not that I was broke because I was sitting around. I was trying; really trying. I know you probably are too. But something was wrong, because it wasn’t working for me. I was working, but it wasn’t working. I still didn’t have enough money. I dreamed about the life I had heard was possible. Then God actually gave me that hot Corvette (the black one in this photo), and He saved me in the process. (Did you know that’s how I got saved? True story!) I began to learn about His Word. And in His Word, I saw a lot more than the meager existence I was barely carving out. I saw that God promises to BLESS His people. I read the 10 practical areas God’s children should govern; and that we are to be the head, and not the tail. That we are to be above only, and not beneath. I read in God’s Word that He promises to provide ALL our needs according to His RICHES in glory in Christ Jesus. And I began to get hungry: not for selfish purposes, but because God said. He said He would bless us, and He always does what He says–IF we do what He says, because the promises of God are conditional. He said we were supposed to do things that are only possible if we have money. Even though money isn’t mentioned in the Great Commission, money is required in order to go ye into all the world and make disciples of every nation. Then, even more recently, I’ve learned that Father actually and DIRECTLY commands us to prosper. It’s not like He just says, “Hey, I’d love it if you’d prosper. I really want to bless you.” He does of course want to bless us; but He actually COMMANDS us to prosper financially! I began to press in and learn how to execute God’s commandments about personal finances. And the first thing I learned as I started down this road is that PERSONAL FINANCE REALLY IS A SPIRITUAL ISSUE. Yes, I wrote that all caps on purpose; I hear Holy Spirit shouting it. I learned that personal finance is a spiritual issue. Whether you are blessed–or not–is very much a spiritual issue. ‘Blessed are You, Lord God of Israel, our Father, forever and ever. Yours, O Lord, is the greatness, the power and the glory, the victory and the majesty; for all that is in heaven and in earth is Yours; Yours is the kingdom, O Lord, and You are exalted as head over all. Both riches and honor come from You, and You reign over all. In Your hand is power and might; in Your hand it is to make great and to give strength to all. Now therefore, our God, we thank You and praise Your glorious name. But who am I, and who are my people, that we should be able to offer so willingly as this? For all things come from You, and of Your own we have given You” (1 Chronicles 29:10-14). Everything belongs to God. It’s all His. Everything on heaven and earth–your car, house, bicycle, hut, tent, food, clothing, washing machine, dog, husband, wife, child–everything belongs to God. You and I own NOTHING. Therefore, personal finance is a lordship issue. God is the Owner, and He’s got the Owner’s manual to money (and everything else). He wrote the Manufacturer’s specs, and He knows how things work! He even took the time, ever so sweetly, to tell us all about how things work in His message to us, the Bible. When we read that message and do what it says, everything works the way He said it would! Blessing and favor and abundance and provision fall out of Heaven–directly from His hand–into our lives. But when we disobey–even if we do so out of ignorance, when we truly don’t know we’re disobeying–things don’t work well. We aren’t blessed. We don’t have enough. Poverty ensues. This is what I learned when I was so poor. I had been truly poor in both money and spirit and attitude, because I didn’t realize what the Manufactuer’s specs said. So I was utterly without tools, and felt utterly without hope, too. So how do we start to bring change into our financial situation? It starts with a road map. It starts by digging out God’s Manufacturer’s specs from His Word, the Bible. That’s what I did, and I’m going to walk you through the same process I went through–just in a more orderly way. It requires us to take a realistic look at the state of your financial affairs. It requires us to break at least three specific curses off our finances if they’re afflicting you (maybe more, depending on your situation). It requires us to obey the conditions God put forth in order for us to be blessed. It requires us to extricate ourselves from the financial snares the enemy tries to tempt us into. It requires us to come out of agreement with demonic lies and snares regarding our–or other people’s–finances. And it requires us to take practical steps to submit to God when it comes to your finances. I am living proof that God’s Word about finances works. The road map I outlined above works. When I first started to try to get my finances in order, I was in a mess. I was broke. I was poor. I was in debt. I had never seen a thousand dollars in my life. But within a few weeks, when I started to obey God, I suddenly had a $1,000 emergency fund in the bank. (First time I had ever had savings!) I started paying my credit cards off. From that day to this, God has blessed me (and then my husband, after we married) increasingly. It took us time, but we now have zero credit card debt. Our student loans have been paid off. The only real estate debt we have is on a rental property (which we are working on selling, Lord willing) plus the mortgage on the house we live in (which we are working on paying off). We are only a few hundred dollars away from having my car totally paid for; and my husband’s car has been paid for for many years. We’re not where we want to be yet. We still have things to work on, like getting rid of our mortgages and replacing my husband’s car. We also still need to increase our income in order to be able to travel and preach like the Lord is calling us to do. But I’m not trying to tell you a story about perfection. I’m trying to tell you a story about provision and help. GOD’S provision. I’m being transparent with you because He’s brought me out of so much lack and poverty. Literally giving my last $2, and another time giving up my only $2–a different $2 that I had saved and kept back when I was younger–to buy groceries for the family. He’s helped us. And He accelerated His help when I started down the spiritual road map to financial rebirth that I listed above. I’m going to talk with you about that road map over the next few weeks. Will you join me? Crossing over from poverty into blessing is going to take action on your part, but you can do it. Father will help you. You CAN cross over into blessing, and you can see the abundance promised in His Word manifest in YOUR life. Does this word speak to your heart? If so, please leave a comment below. I’d love to hear from you! Ready to get rid of all my ugly baggage and eagerly awaiting my spiritual road trip. Ready to claim my inheritance in Christ . Blessings to you all. Yes Yes Yes, I am absolutely ready enguage the Holy Spirit Road map for financial freedom. Yes. Thank you, Holy Spirit! Thank you, Jamie! I will join. In such dire need for your road map! Thanks Jamie, much blessings to you! OK Jamie, you have done it again! I am hanging on to every ‘Word’! Can’t wait to read and put into practise, your (His) teachings! To break the circuit and never look back! Thank you Jamie. I never thought of money as a spiritual issue. I have been on this journey for a while now. And it’s working! I even wrote a prayer concerning breakthroughs, jobs, careers, ideas, businesses, and increase. And yes provision which includes a DEADLY prayer battle against the enemies and the blood of Yeshua (Jesus) to cleanse. Btw, on a slightly different topic. I have prayed the “Prayer About Unjust Situations” concerning my job and got some extra hours that they took away! It works. I had to break some bonds off of my angels on assignment and bust walls down. Then boom, the same day (an hour later) my job called me and gave me my hours. Halleluyah! Just wanted to thank you for sharing your testimony about unjust situations. That blest my socks off! It sure increases my faith in God. Yes ! I’m in Jaime , and ready for change and curses to be broken Amen ! Yes Lord! This is on time for me. Thank you Jamie. Yes. Thank you Jamie. He has been dealing with me this week strongly on financial issues and about trusting Him. Over a week ago, he made me give away almost all of my paycheck to Him through tithing, giving large sums to people who needed it and telling them not to give it back, that included my rent money too. It has been a tough week because after saying “Yes, Lord” and then nothing happens… It got scary. I felt like I had been abandoned and I was scared the landlord would confront me and demand his money. But He gave me peace in the midst of my trials and He told me to “keep thanking me,” which I’ve been doing. Yesterday morning He revealed to me the true reason behind my lack – spiritual curses. He showed me how to go before Him as Judge and seek ALL that the enemy had held back or denied over the years (I’ve prayed for provision so many times in my life that never came – and the Bible says “hope differed” leads to a broken heart). I didn’t really trust God anymore to be my provider because of those experiences in the past. Today is Saturday 8 April 2017 and I know that today I will see the awesome power of the Lord God move in my life. I will witness His Hand move in the realm of my finances in ways I’ve never seen Him move. Amen, Amen and Amen. Blessings to ALL. 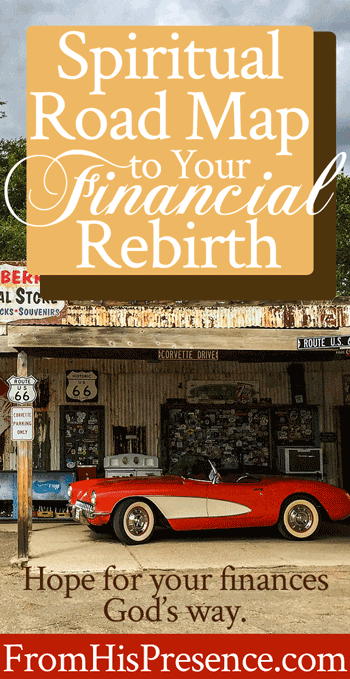 I’m joining you on the road to financial rebirth! This is speaking directly to me. Amen and thank you! WOW amazing word, thank you Holy Spirit. I am in road to financial rebirth!!!!!! Hallelujah Glory to God, He has commanded us to be prosperous. We Must follow ALL commandments of the Father. ???????? Yes ! Count me in. Thank you Holy Spirit . My family needs to get out of this spirit of financial curse . We’re going to come out with the help of our Lord Jesus Christ. The devil is a liar. I don’t know how the first paragraph came into my comments. Yes my family wants to come out of this financial curse! I need time to let it sink in that this is a spiritual issue. Never thought of it in that way. I’m ready to be free of student loans! It’s such a heavy burden. 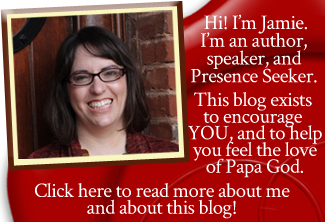 Jamie, I love and appreciate you and your posts! Oh, how I need this! Looking forward to it Jamie! Sign me up. I am totally in, shine the light. I like the comment on hope deferred. l am ready to crossover from poverty to absolute financial abundance in Jesus’ name. Yep; Count me in! Getting out of debt, money in my savings account, investing and being able to travel for ministry is on my list of things to do this year; 2017. Hi Jamie! I am in. If it is on a Saturday, I won’t be home until later in the afternoon. I attend service on Saturdays. look forward to finding out about and operating in God’s roadmap to prosperity and blessing. Thank you again. Thank you Jamie. Im so in. I want to know more on how to get out of financial lack. Im tired of it. My name is Michelle and I’m an ardent tither. But I find that I’m still living from pay cheque to pay cheque. Many times I’m in lack and have to wait for month end to come . What am I doing wrong that is not attracting the blessings of the Lord? Hi Michelle! It’s hard to answer that question specifically since I don’t know all the details of that situation, but I really recommend reading all the posts I wrote on this blog a few weeks ago about the spirit of poverty–including listening to my webinar about getting free from the spirit of poverty–and see if Holy Spirit shows you a missing key to your situation. I prayed for you just now!